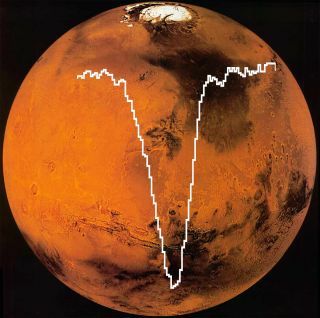 The flying observatory SOFIA's measurement of atomic oxygen in Mars' atmosphere is superimposed on the Red Planet itself. Researchers' new measurements of the highly reactive element will let researchers model the planet's conditions much more accurately. The airborne SOFIA telescope has measured atomic oxygen in Mars' atmosphere, the first such measurement in 40 years, providing a new way to monitor the vital element and gain more data to calculate the oxygen atoms' effect on the planet's surface. NASA's Mariner and Viking missions sent back measurements of atomic oxygen in the 1960s and 1970s, but this is the first detection of the elusive atom from afar, courtesy of the airplane-turned-telescope SOFIA (Stratospheric Observatory for Infrared Astronomy), which is run by NASA in partnership with the German Aerospace Center. Backman is referring to atomic oxygen — just one oxygen atom — rather than O2, which is the two-atom substance humans need to breathe. Atomic oxygen reacts with other elements much more easily than does O2. This means atomic oxygen doesn't stick around in the atmosphere for long and can be very difficult to measure. SOFIA measured the atomic oxygen in Mars' atmosphere using the craft's German REceiver for Astronomy at Terahertz Frequencies (GREAT), which got the benefit of flying above much of Earth's disruptive atmosphere while making measurements. The Stratospheric Observatory for Infrared Astronomy (SOFIA) observatory, a flying telescope built into a Boeing 747 jumbo jet, takes off. SOFIA is a joint project by NASA and the German Aerospace Center (DLR). The research team used the sensitive instrument to zero in on an infrared wavelength of light released by atomic oxygen. The scientists found that the overall amount of the element present in the atmosphere is only about half the level previous models predicted. Atomic oxygen forms on Mars when ultraviolet radiation hits H2O on the planet's surface, splitting the hydrogen off to be released into space. The oxygen atom will soon join up with most atmospheric molecules it encounters; if it unites with O2, the combination will create ozone, which has a protective effect on the planet by dispelling some of the ultraviolet radiation beaming down from the sun. Because of that process and atomic oxygen's general reactive nature, understanding the precise levels of atomic oxygen and ozone in the Martian atmosphere is vital to determining how friendly Mars would be to subsurface-dwelling microbes, Backman said. Orbiters and rovers on Mars may get high-quality snapshots up close to the Martian surface and atmosphere, but SOFIA's added perspective can be a boon for broader measurements, Backman said. "The SOFIA spatial resolution lets us make three or four measurements across the disk of the planet, so it's like you're looking at an Earth-sized continent's worth of Mars in one gulp, whereas the orbiters around Mars, they're only seeing tiny, little patches," he said. "With SOFIA, because we're standing off a long ways, it has the disadvantage that we're not getting spatial details, but it has the advantage that we're getting more global information about Mars." While Earth-based observatories have to contend with this planet's disruptive atmosphere, SOFIA's 8-hour trips into the stratosphere eliminate much of that problem while keeping the observatory a helpful distance from what it's observing. To follow up on these measurements, SOFIA officials said, they could use SOFIA to track the seasonal changes in atomic oxygen (a full year on Mars is about two Earth years). They could also investigate the variation over the surface by measuring when different parts are facing Earth, the officials said. This particular experiment investigated only Mars' atomic oxygen, but on a flight a few months ago, SOFIA also measured the amount of methane, a gas whose presence is suggestive of life if it appears in nonvolcanic regions. Those results should be published in a year or so, Backman said. SOFIA's measurements of Mars can enhance observations made by NASA's MAVEN orbiter, currently scoping out the Red Planet's upper atmosphere. SOFIA instruments have probed Jupiter's atmosphere, Saturn's moon Titan and even Pluto's atmosphere, just before NASA's New Horizons probe flew by the dwarf planet in 2015. But SOFIA's views don't stop at the solar system; the GREAT instrument "is a big interstellar chemistry machine, investigating the chemistry in star-forming regions where organic molecules get cooked up and stars and planets form," Backman said. "This instrument is more used for that than for planetary investigation." The new work was detailed in the journal Astronomy & Astrophysics in 2015.